For the complete story, as expanded by the Bay View staff, go to the paper’s website (www.sfbayview.com). The ramifications of the incident are endless, entailing community involvement in planning, jobs for Hunters Point residents, the city’s waste management and its effect on residents in the southeast part of the city, and environmental and historical preservation. It’s a story that will continue to play out over many months to come. Here’s how it all began, in an article published on November 24 by San Francisco IndyMedia (sf.indymedia.org). San Francisco Muni light rail construction breaks a sewage main which normally delivers 80 million gallons per day of secondary effluent to the bay. A disastrous mess results: The park floods, a sinkhole appears and gobbles trees and backhoes, sewage pours into the channel, the community is devastated, and some serious questions are exposed regarding development in the southeast quadrant of our city. Construction crews for the San Francisco PUC have been working for months on installing “duct banks” under Islais Creek to bring power, communication, and data cables to the north side of the creek east of Third Street as part of the preparation for the future Muni Third Street light rail project. The Muni maintenance yard is being built near Pier 80, between 25th and Cesar Chavez east of Illinois. For some reason the Hunters Point Power Plant is the source of electricity. As construction worked northward, on Sunday or Monday Muni subcontractors inside the Muwekma Ohlone Sanctuary Park drilled crosswise under a five- or six-foot sewer main that heads toward the bay to place a black tube which will hold the lines. Then they went home. On Monday or Tuesday a local resident saw spurts of muck shooting out of the earth leaving volcano-like one- or two-foot mounds of earth over the area. Neighbors called in reports. Following the complaints, emergency repair crews arrived and have been working day and night since Tuesday. The PUC, DPW, Water Department, Port of San Francisco, Sewage Department, SF Muni, welders, laborers, consultants, insurance reps, and several permits officers came as well. A diver who went into the damaged pipe for repairs on Tuesday discovered the tunnel had collapsed. Removal of the land supporting the huge sewer main had caused shifting, then a crack and leakage. The bay fill land had liquefied and sewage spilled out. A worker who parked on the pavement toppled down into the hole atop his backhoe, nearly losing his life. Park activists converged and attempted to save their tools and plants. The leak has most likely stopped, but the toxic spill has ruined the Muwekma Ohlone Park that Islais Creek activists had developed with time and effort and love. A sinkhole 20 ft. deep by 60 ft. long by 50 ft. wide and a field of mud now replaces what used to be flowers, trees, creatures, and community. The park was the result of years of work on land traditionally occupied by the Ohlone tribe. It had become a sanctuary for native plants, birds, and community groups, a refuge of green surrounded by the ships and towering industrial machinery of the Port of San Francisco. “Guerrilla gardeners” maintained the site for eight years with the permission of the port. Using a USDA urban partnership grant they won a year ago, they master-planned habitat restoration of the land and intertidal areas, and outlined environmental education programs. This past year groups such as the SF Conservation Corps, SLUG, the Wildlife Habitat Council, the Living Art Community and many Bayview and Islais groups and individuals undertook a massive cleanup, restoration, and support of the area. A habitat survey turned up four or five protected species, plus one unique vertebrate never before encountered, which was enthusiastically documented by the California Academy of Sciences. In a ceremony in August indigenous residents of San Francisco donated special earth. The group held art and cultural events last summer, including a Native American film festival in May. It planned a healing pole and a history placard, and received two other significant grants. Emergency cleanup crews are still frantically working day and night to remediate the situation. Eighty million gallons of secondary (post treatment plant) effluent went through the main and now goes into Islais Creek. There is a $15/gallon fine on the books, reflecting the seriousness of this type of spill. In fact, the cost of the clean-up may pale next to the impending fine. On Thursday, Thanksgiving Day, workers welded bands on the sewer pipe, awaiting a custom gasket which was being flown out from the east coast to enable them to re-pressurize and test the main. Muni talked of putting concrete around the pipe on Monday. The disaster opened up a whole new set of ominous questions. Why were the transmission lines being run to the Hunters Point power plant, which supposedly is to be closed, instead of running to the much closer Potrero plant? 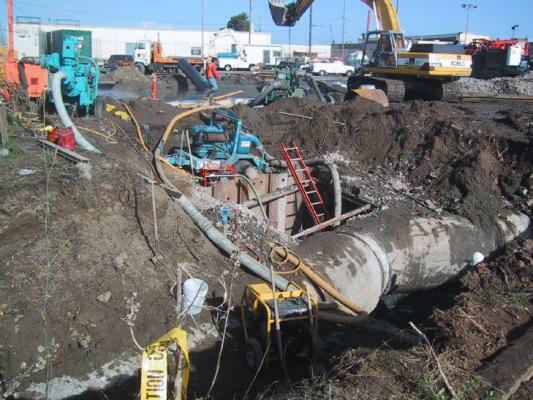 Why was the city drilling under a sewage main on fill with a high risk of liquefaction? Where are the Environment Impact Reports for this work and for the duct banks for the line under the creek? It’s even possible that they weren’t sure there was a sewage outfall above the drilling. Perhaps Sophie Maxwell and City Hall should call for hearings to bring some sunshine to bear on what’s going on. And at the same time, in the same area, why is the Illinois Street railroad bridge suddenly (via pressure and money from Catellus) being transformed into a two- or four-lane intermodal (with rail)? A north-south corridor for huge trucks to travel from the asphalt and concrete plant across the channel at Pier 90 to serve Mission Bay developments? Threatening to cut through Illinois Street alongside residences and the sanctuary, it will destroy the loading docks, the outrigger canoe club, the shoreline, and intertidal habitat. Neighbors are organizing to stop the looming threat of traffic and pollution to this unique corner of the city. To get involved contact david@islaiscreek.com. Chronological photos by David Erickson and Maurice Campbell are posted at www.monkeyview.net/zabudam%40pacbell.net/sewercollapse/index.vhtml show the progress of the damage.